Snowdonia National Park is with its 823 square miles the biggest national park in Wales. It boasts 14 peaks over 3,000 feet (amongst them the highest mountain in England and Wales), over a hundred lakes and picturesque villages. To enjoy a small part of this fabulous park, we have developed four different walks for your benefit. We have written down easy to follow descriptions and made copies of the Ordnance Survey map of this area with the routes marked. The ascent to Wales’ highest peak (3,560 feet) goes via the Snowdon Ranger Path and the descent via the Ryd Ddu Path. Estimated time and distance: 6 hours and 14 km. Start and finish: Rhyd Ddu. Walk up to the saddle between Mt. Aran and the south ridge of Snowdon and down via the beautiful valley behind it. The path continues over the land of Craflwyn National Trust and follows a river to Beddgelert. Estimated time and distance: 5.5 hours and 13.5 km. Start: Rhyd Ddu and finish: Beddgelert. 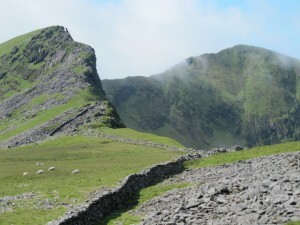 During this round walk you climb three (of the five) peaks of the Nantlle Ridge. The route back to Rhyd Ddu is via the Beddgelert Forest. Estimated time and distance: 5.5 hours and 9 km. Start and finish: Rhyd Ddu. A relatively easy walk with fabulous views and a great variety of landscapes. 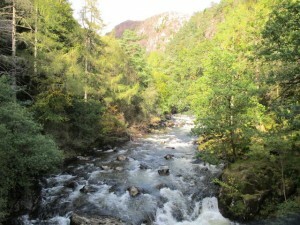 The final part is through the Aberglaslyn Pass, this river gorge was chosen as Britains’ most beautiful spot in 2008, according to a National Trust poll. Estimated time and distance: 5.5 hours and 13.5 km. Start and finish: Beddgelert. Stay at Tŷ Mawr and we will lend you the descriptions and maps free of charge. Why not take your landscape photography knowledge and experience up a level? Ty Mawr B&B is happy to accommodate guests who’d like to learn a lot more about landscape photography by joining a course lead by Jan Chipps, a professional photographer and tutor who lives locally (6 miles from Rhyd Ddu). She has more knowledge of picturesque spots than anyone else in north Wales. Jan’s courses are tailor made; you choose the number of days you’d like. Her individual tuition suits all levels. For more information on the courses and bookings you can contact Jan directly on: Photos@janchipps.force9.co.uk.